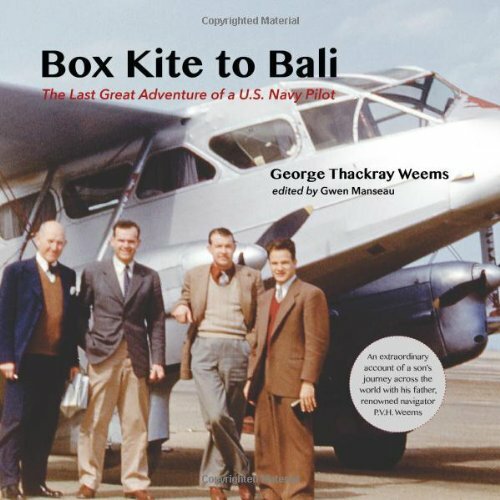 Box Kite to Bali: The Last Great Adventure of a U.S. Navy Pilot is a delightful story of a memorable trip based on drafts of a never-published article for The Saturday Evening Post by George Thackray Weems, Naval aviator son of PVH Weems. In early 1950, Weems, nicknamed “Bee,” convinced his father, Capt. PVH Weems, to join him on a trip halfway around the world in a prewar biplane along with Bee’s aviator friend Willie Eddins and aircraft engineer James WH Smith. The story of their journey from England to Australia — four men and a plucky wood-and-fabric biplane battling monsoons, red tape, and postwar political upheaval all while maintaining a sense of humor — makes for a fast and fun, but highly informative, read in classic travel-narrative style. Box Kite to Bali was edited by Gwen Manseau, great-granddaughter of PVH Weems. It is lavishly illustrated with photos taken on the trip as well as reproductions of documents such as letters and telegrams from the trip and saved by the Weems family. It also offers some valuable insights into the character of PVH Weems, who was a spry 61 at the time of the trip. I highly encourage anyone who’s interested in the history of PVH Weems, air navigation, postwar European and Southeast Asian history, or travel narratives to get a copy. You will enjoy it. I am grateful to Ms. Manseau and the Weems family for correcting The Saturday Evening Post’s oversight in sharing this charming tale with the reading public. Box Kite to Bali is available from publisher Fox Road Press and on Amazon.